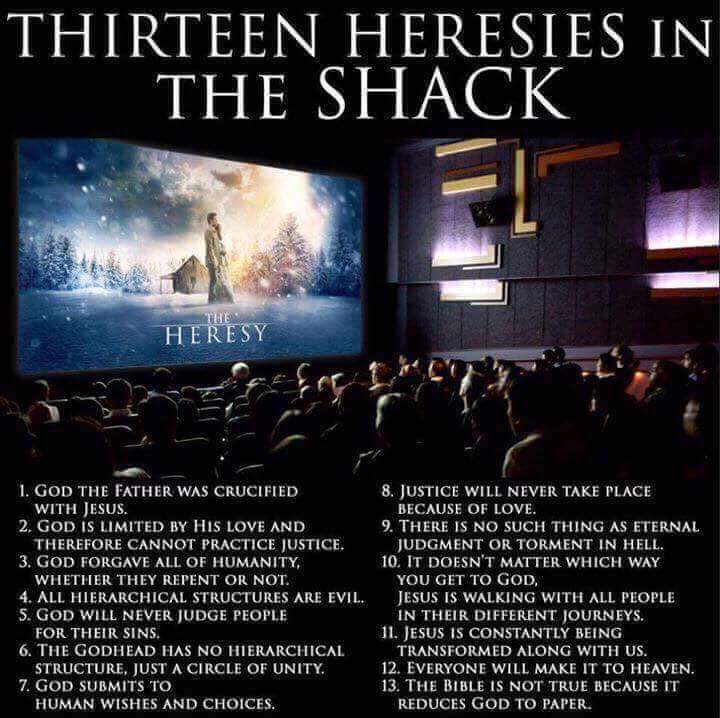 The Shack is a false Christian book & movie. "1. God the Father was crucified with Jesus (p96). Because God's eyes are pure and cannot look upon sin, the Bible says that God would not look upon His own beloved Son as He hung on the Cross, carrying our sins (Habakkuk 1:13; Matthew 27:45). 2. God is limited by His love and cannot practice justice (p102). The Bible declares that God's love and His justice are two sides of the same coin — equally a part of the personality and the character of God (Isaiah 61:8; Hosea 2:19). 3. On the Cross, God forgave all of humanity, whether they repent or not. Some choose a relationship with Him, but He forgives them all regardless (p225). Jesus explained that only those who come to Him will be saved (John 14:6). 4. 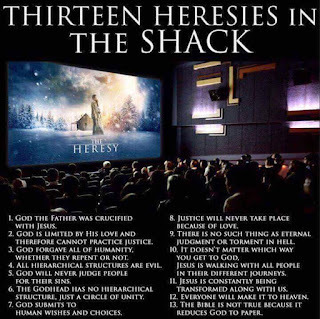 Hierarchical structures, whether they are in the Church or in the government, are evil (122). Our God is a God of order (Job 25:2). 5. God will never judge people for their sins (p120). The Word of God repeatedly invites people to escape from the judgment of God by believing in Jesus Christ, His Son (Romans 2:16; 2 Timothy 4:1-3). 6. There is not a hierarchical structure in the Godhead, just a circle of unity (p122). The Bible says that Jesus submitted to the will of the Father. This doesn't mean that one Person is higher or better than the other; just unique. Jesus said, "I came to do the will of Him who sent me. I am here to obey my Father." Jesus also said, "I will send you the Holy Spirit" (John 4:34, 6:44, 14:26, 15:26). 7. God submits to human wishes and choices (p145). Far from God submitting to us, Jesus said, "Narrow is the way that leads to eternal life." We are to submit to Him in all things, for His glory and because of what He has accomplished for us (Matthew 7:13-15). 8. Justice will never take place because of love (p164). The Bible teaches that when God's love is rejected, and when the offer of salvation and forgiveness is rejected, justice must take place or God has sent Jesus Christ to die on the cross for nothing (Matthew 12:20; Romans 3:25-26). 9. There is no such a thing as eternal judgment or torment in hell (p248). Jesus' own description of hell -Luke 16:23"